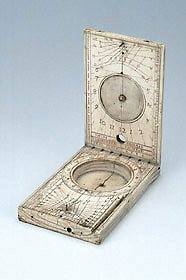 This dial has on the outside of the upper leaf a rotating brass volvelle which constitutes part of a dial. The triangular gnomon is unfortunately missing. Both ivory leaves are inscribed with mottoes and instructions on the use of the instrument.